It's far more than a black rock! 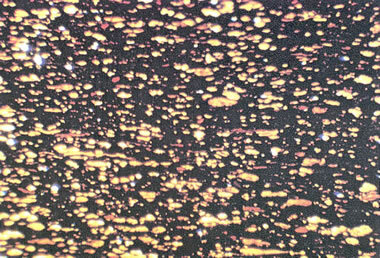 Splint coal: This is a highly magnified view of splint coal in transmitted light. The large yellow object in the center of this image is a spore - a reproductive cell of the coal-forming vegetation. It is about two millimeters long. The spore was probably round before it became part of the coal-forming plant debris. It was squeezed flat after burial. The thin red bands running horizontally across this view are thin shreds of well-preserved woody material. The tiny yellow and orange particles are smaller spores and algal debris. The black material is either charcoal or opaque mineral matter. This coal does not contain a lot of well-preserved wood. Instead it is mostly charcoal and mineral debris. The material in this view is representative of coal that formed under conditions that were not ideal for the preservation of plant material. Enlarge image. 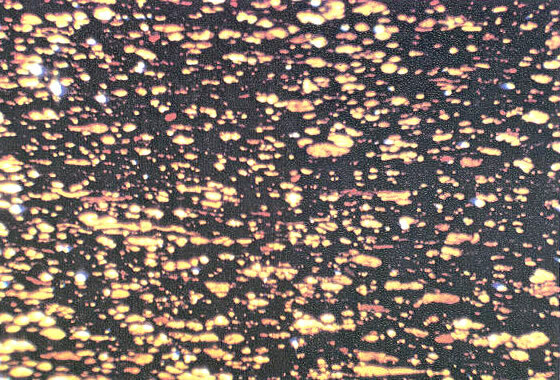 If you think that coal is a boring black rock, then you have never seen it through a transmitted light microscope. The microscope reveals coal's hidden beauty as well as its organic composition. Coal seams form from thick accumulations of plant debris, usually deposited in a swamp. The tiny particles of plant debris and swamp sediment give a spectacular show of color when viewed through the microscope. Well-preserved woody material is bright red, spores are brilliant yellow, algal material is yellow-orange, charcoal and opaque minerals are black, and grains of many transparent minerals are white. It's hard to believe that coal can be so colorful! Humic coal: A thin section of coal made up almost exclusively of very well preserved woody material. Note the thick red bands. Each of these represents a twig or other preserved piece of woody material. This view shows only minor amounts of mineral matter and degraded plant materials. 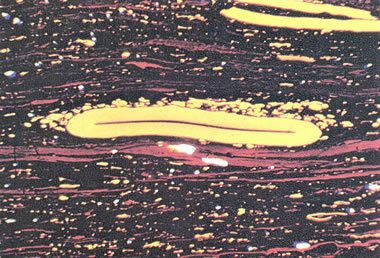 The area shown in this thin section is about two millimeters wide. It represents the type of coal that forms under excellent conditions of plant preservation. To best understand coal we should start with a hand specimen of coal like the one shown below. If we look closely we will see that it is not a uniform black. Instead there are different shades of black and also different lusters. The coal shown below is a "bright banded" coal. 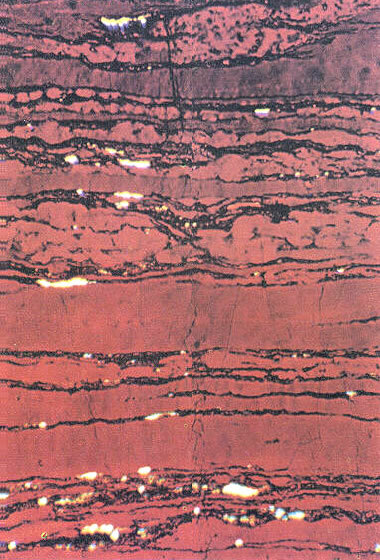 It is dominated by bright shiny bands which represent well-preserved woody material. Between those bright bands are some thin dull bands. Those dull bands are composed of substances such as mineral material, degraded woody material, and charcoal. Charcoal? Yes, some coals contain lots of charcoal. There were fires in the swamps just like there are fires in the Everglades. 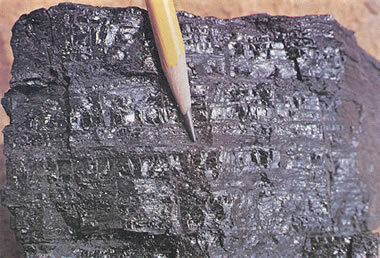 Coal banding: When viewed closely, most pieces of coal are composed of alternating bands of bright and dull material. Image by West Virginia Geological and Economic Survey. Enlarge image. Cannel coal: This is a thin section of "cannel coal." This type of coal is composed of large amounts of spores, resins, or algal materials. These types of plant debris are very resistant to decay. When they are found in high concentrations with charcoal and mineral matter, it suggests swamp conditions where the woody material decayed away and the more resistant materials accumulated. This image represents a view of coal that is about four millimeters wide. Enlarge image. Boghead coal: The coal shown in this view is known as "boghead coal." 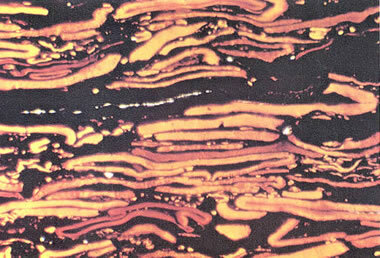 It contains large amounts of preserved algal debris which appear in this image as the yellow-orange particles. This type of material might accumulate on the fringes of a swamp where there is a lack of wood and other coal-forming plant materials. This image represents a view of coal that is about four millimeters wide. Enlarge image. "Transmitted light" means that light is passing through the coal, just like light passes through a stained glass window. This requires a very thin slice of coal called a "thin section." The slice must be so thin that light easily passes through it. Here's how a thin section is made. First a small block of coal is cut with a saw to form a flat surface. The surface is then ground and polished until it is exceptionally smooth. That flat surface is then glued to a microscope slide. 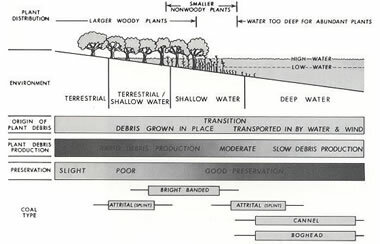 Coal environments in a swamp: A generalized diagram of a swamp, showing how water depth, preservation conditions, plant types, and plant productivity can vary in different parts of the swamp to yield many types of coal. Illustration by the West Virginia Geological and Economic Survey. Enlarge image. As mentioned above, coal forms from plant debris that accumulates in an environment such as a swamp. There are many possible situations of plant types and environmental conditions that produce a variety of coal types. Within a swamp some areas might be shallow and other areas deep. Some areas might have woody plants and other areas grassy. The environment might be changing over time, making the bottom (older part) of the coal seam very different from the top. These variations result in the formation of many different types of coal - all within the same coal seam. You have seen how plant types and environmental conditions can produce a variety of types of coal within a single swamp. Now imagine two different coal swamps, in different parts of the world and at different points in geologic time. They might have coals of even greater diversity. Coal is a very complex rock, and that complexity is part of what makes it so interesting.